Alyssa Viscardo, star junior softball pitcher for Villa Maria Academy High School, Malvern. The Villa Maria Academy Hurricanes’ softball team is having a remarkable season. Much of the success would not be possible without stellar junior pitcher Alyssa Viscardo of Malvern. 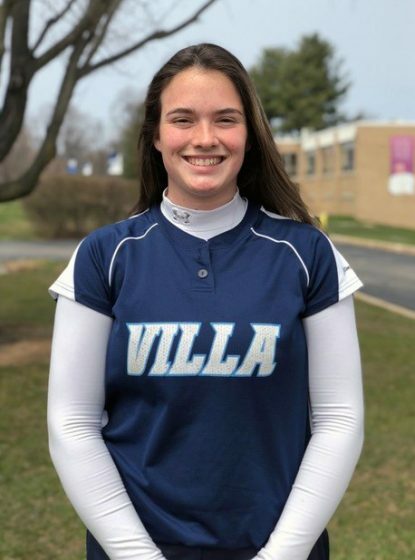 “She is a very good pitcher, practicing year round,” said Villa Maria head coach Nikki Hartshorn. Year-round softball is a regular part of Alyssa’s lifestyle starting in first grade with Little League T-ball. From there she has gone to play softball for South Jersey Mystics, a travel program open to players ages 9 through 18. She also played at the grade school level in seventh and eighth grade at SS. Peter and Paul School in West Chester before moving up to the high school level. Softball has put Viscardo on a long road, literally. With her travel team she has traveled all over the country, and recently from New York to Arizona to Georgia over the course of a 10-day period. “It’s been pretty crazy,” she said. Viscardo ended up at Villa Maria despite its softball program. She was in search of an academic challenge and wanted to stay in touch with friends in Chester County as well as make new ones. As a freshman, she did not receive a lot of time on the pitcher’s mound but was the starting shortstop for the Hurricanes. That changed the following year when the team needed someone to take over the on the mound. During her sophomore year, Viscardo made a big decision regarding her future. She committed to playing softball for the University of Hartford. Initially, she had been looking at Wagner College in Staten Island but when she heard that Wagner’s coach was transferring to Hartford, it helped her to make this commitment. Additionally, she loved the beautiful campus and plans to study economics. “She’s been very popular at showcases where you get recruited,” said Hartshorn. Viscardo is having quite the year as a junior. When the Hurricanes took on St. Basil Academy, she gave up no hits and recorded 14 strikeouts. She fanned 13 batters against Upper Merion before allowing one hit and striking out 10 against Gwynedd Mercy. She averages 12 strikeouts per game. At Villa Maria, Viscardo is also a member of the Environmental Committee. She admits to the challenge of managing her time between academics and softball. Although there is no travel softball during the high school season Villa Maria generally holds two hours of practice on non-game days. Additionally, Viscardo works out in the morning and/or after practice before coming home to do her homework. The travel softball season for her usually begins the first weekend in June with a tournament at Seton Hall or the Pennsbury Invitational fields, one of Alyssa’s favorite ballparks. “I have so many good memories with my teammates there,” she said. At this point, Villa Maria faces some tough competition these final weeks of the regular season as the Hurricanes vie for a playoff berth. “I think we’re going to keep going strong, keep our intensity up stay together and not take anything for granted,” said Viscardo.